In an earlier post, I said that James Weigand had asked about teachers per student and SOLs. In fact, he asked about that in elementary school. 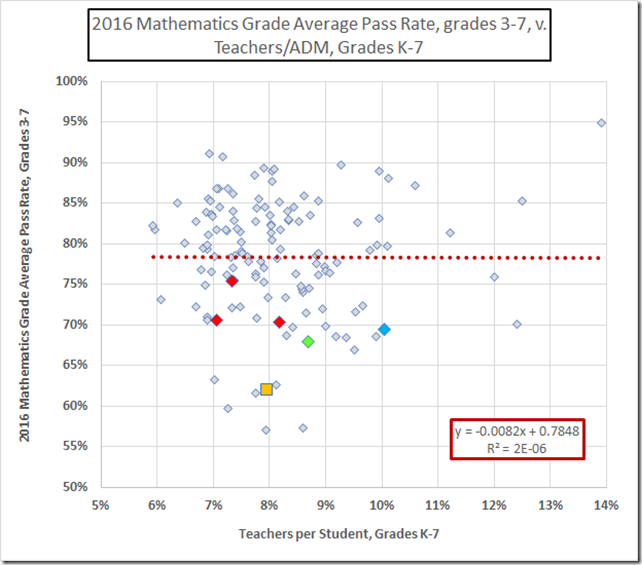 Table 17a in the 2016 Superintendent’s Annual Report gives us the pupil/teacher ratios by division for grades K-7; that grade range extends beyond elementary school at both ends (grades 6 & 7 are middle school these days). Moreover, the SOL testing begins only in grade 3. 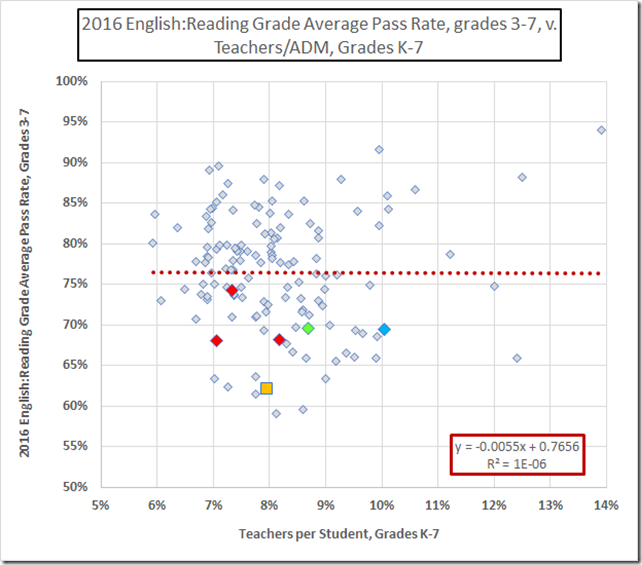 Thus the pupil/teacher data and the pass rates are for different grade ranges. 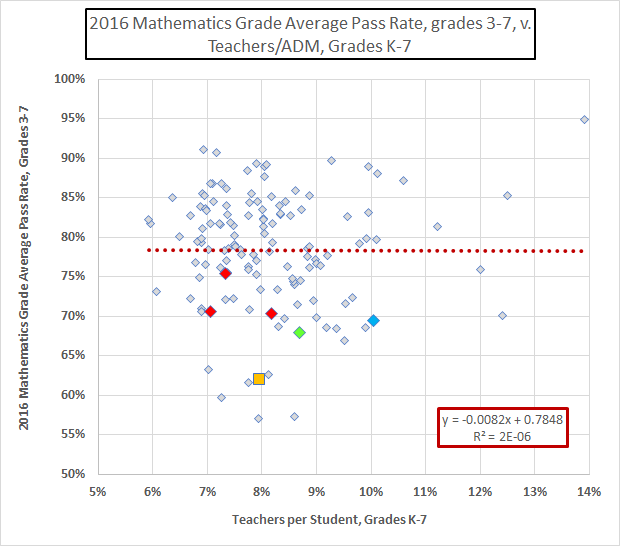 As well, the VDOE database will give the pass rate for each grade but not an average over grades 3-7; the best we can do is take the rates of each grade and average those. 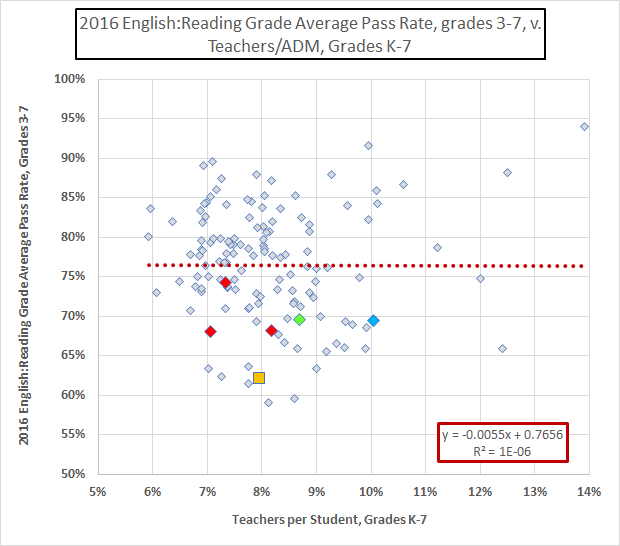 With those limitations, here are the reading data for the last year with available data, 2016. Richmond is the gold square; Charles City, the green diamond; Lynchburg the blue diamond. The red diamonds are our peer cities, Newport News, Hampton, and Norfolk, from the left. Excel is happy to fit a line to the data but the R-squared tells us there is no correlation. Given the constraints on the data, it would be rash to draw any conclusion beyond the absence of a correlation in these particular datasets. Except, of course, for the obvious: Richmond by any measure is racing for last place. With a nearly average number of teachers (Richmond is 8.0%; the average is 8.2%) we get awful pass rates.